Online dating industry giant Match is looking to distinguish itself from the more popular dating apps like Bumble or Tinder. 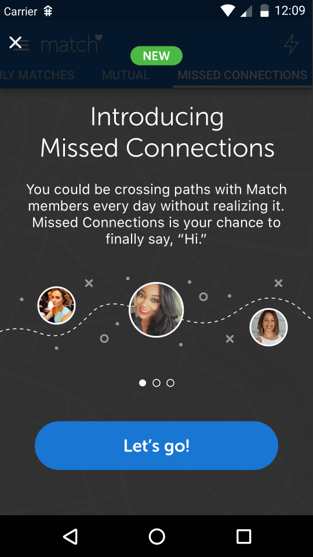 In an effort do this and to attract new customers, Match unveiled “Missed Connections,” a location-based feature that allows users to see other members they have crossed paths with in real life. For example, if you walked in your neighborhood park this morning or grabbed coffee at your favorite coffee shop, you can see who on Match did the same and reach out to them. The new feature offers a more organic approach to dating. Match hopes it will help people connect more easily in real life instead of relying on messaging, which has become an issue with many dating app users. In Match’s upcoming “Singles in America” survey (which will debut in early February), 55% of singles say they feel that technology has made it more difficult to connect with others in real life. Match uses hyperlocation technology and detailed algorithms to show where you might have crossed paths with other Match members during your day. When you click on a user who has visited the same places you have, you’ll be able to message them and start a conversation. The new feature makes geolocation a priority in your search criteria, and even reveals the intersection points for the last place you both visited (within one block), and the number of times a person has crossed paths with you. Match is hardly the first app to offer matching its users with people they might run into in real life. Happn is another location-based dating app that shows who you might have missed meeting on the subway, or at the restaurant you just visited. So if you’re the shy type and didn’t ask for her number or were too nervous to approach, if the object of your affection is signed up on Happn, her profile will show up on your timeline. 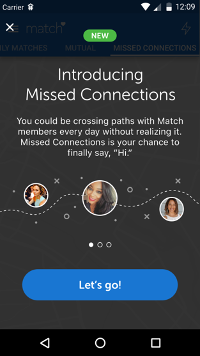 According to Match, unlike other location-based dating apps, the goal of Missed Connections is to use location as an extension of its existing algorithm matching process. In other words, the people who you see in Missed Connections also match with you in terms of personality, education, or other factors. The beta version of Match’s new feature is already available in San Francisco and Dallas, and it seems to be doing well. More than two-thirds of Match users in those two cities have opted in to the Missed Connections feature on their Match app. Among those users, there were twice as many conversations using the Missed Connections feature. And as Match points out, frequenting the same places gives you a starting point for conversation with your matches, and an easy way to meet in person. For more on this service please read our Match review.